A commercial space which is going to be the first choice for next generation! In-par with digital India, Anthurium business park is the conceptualization and implementation of advanced digital space to make virtual offices a reality here. The business park is well-equipped with AI – ready technology to renovate the traditional business methods for the next generation workforce. Anthurium Business Park Noida is strategically designed with exclusive AI ready office spaces. These smart offices allow you to customize the space as per your business needs. Anthurium, the next-gen workspace is ideal for BPO, KPO, multi-national companies and corporates. Anthurium Business Park is offering the maximum prospect to business owners and investors. Do you have a dream of starting your own business? Find a great opportunity to start your business at a future ready space. Anthurium presents commercial space for high-end retail shops, cafes and renowned brands. Anthurium Business Park Noida provides a well-equipped convention center and exhibition space. This is an ideal space for different kinds of events including exhibitions, conferences, workshops and meetings, with a plenty of space to accommodate a number of participants. We support new ideas to aid your business. Anthurium, the next-gen business park offers coworking space for professionals. No matter you are a freelancer, an entrepreneur, an owner of a startup business, Anthurium is the solution to all your office space needs. Our future ready offices are designed to suit multiple innovative ideas in your business. You can relieve your stress by accessing to our unique rooftop bars and restaurants offering amazing green views and exclusive outdoor rusting environment. It provides a perfect blend of work and pleasure. Live a healthy lifestyle by accessing to Yoga, spa, fitness and rejuvenation centre! The presence of these services will allow individuals to get a right work-life harmony. Anthurium business park embarks a Platinum rated Green Building with Bee and Griha, and a Bionic Bioclimatic Architecture to balance the environment within the building. The architecture concerns itself with the climate as a major contextual generator and is designed with benign environment using minimal energy. The majestic building of Anthurium business park follows the level 5 BMS regulations to control the building’s electrical and mechanical equipment including lighting, fire systems, power systems, ventilation and security systems. Equipped with the highly advanced security system, Anthurium Business Park Noida provides you with the most secure environment for business and the staff. The building is 100 % friendly complex as per the IHAs standard with the best CCTV and surveillance system. You can find premium retail shops and hassle-free access to common areas in the building. Here you will find the best-integrated environment to enjoy a meeting with your friends and closed ones, shop from reputed brands and work in offices with high-class interiors. So overall, you will have an awesome amalgamation of business and pleasure. Our automated stack, multilevel parking systems offer mechanical car parking services for users. Best use of space with our mechanical car parking system where cars are retrieved by using pallets and lifts. It thus eliminates the requirement for lengthy driveways and ramps, accommodating maximum cars in minimum space. Anthurium Noida is equipped with high-speed lifts, 100% back-up power, and VRV air-conditioning system for energy efficiency. We are one of the most reputed real estate developers and pioneers in delivering projects embarked with technology and innovation to make them a right fit for the digital world. Our unparalleled proficiency in developing innovative ideas into the spectacular property as per the demand of modern work culture has attained recognition around the nation. Every project that we deliver is up to the mark and surpasses the existing approach and structures. We constantly endeavor to provide excellent commercial and retail properties. Everyone requires a work setting that adds to the essence of fun and offers great results. Considering all these aspects, Anthurium is contributing to the expansion of IT/ITES Sectors in Noida. In association with top worldwide landscaping counselors, we ensure delivering the most advanced aesthetics and ambience for a great working experience. The Corenthum is a state of art office complex situated on plot no. A-41, Sector 62 of Noida.Its a yard away from national high-way no. 24 and is abutted by 60 mtrs and 30 mtrs roads on two sides. It is an urban work destination for IT and BPO companies. The property offers smart offices, rooftop restaurants and business center to cater to all business needs. The Corenthum has been designed on fourth generation intelligent building concepts with green environs and stepped plantation geomancy in right Japanese spirits. The Corenthum, Sector-62, Noida is best for Start-ups / IT / BPO / KPO etc. because of the availability of campus style fully furnished office spaces for rent at relatively lower rents than Gurugram & Delhi with corporate look buildings. The upcoming metro route will increase the demand of Office for rent in Corenthum Sector-62. Many major institutes, hospitals, restaurants, banks etc. are in close vicinity.The companies like Morpheus Group, Sysacs Technology, Mahagun and many other are operating from The Corenthum, Sector-62, Noida. The I-Thum Offers Commercial Office Spaces in Noida in its 5 Acre plot & enjoys an additional 5 acre campus of the The Corenthum including leading Banks. Situated right next to NH – 24 , it is abutted by 30 meter arterial road & is on the walking distance of the proposed Metro station of Sector 62 Noida , The i-thum enjoys the neighbourhood co’s vis a vis HCL , Jaypee , Airtel , Nucleus to name a few. THE ICONIC CORENTHUM is a 160 meter tall tower with roof top sky deck for a 360 Degree view of Noida, a state of the art auditorium fine dining at roof top level. The lobes are In modular grid to have central bays for planning office and side bays for executive chambers and communication turntables, with conferencing at its best. The tower is modern, automated, where experience and information are shared. The layout focuses on the increasing need to dynamically connect people to people. Each grid unit has been carefully planned with anthropometrics, string diagram and 24*7 requirement like fresh air building systems and stress-free working. Located in Sector 109, Gurgaon, Caladium is an ambitious residential project with apartments created keeping in mind state-of-art convenience and comfort. Caladium also starkly distinguishes itself from the rest by its intelligent and futuristic layout plan. A classic example of introvert courtyard planning with integrated greens wherein exceptional care has been taken to delalineate proper activity pattern and activity concentration. The Green areas have been kept entirely free from traffic, thereby enabling uninterrupted activity zones for children and leisurely spaces for social gatherings. Spread over 3.67 acres, this lush green spatulate plot is strategically located alongside the 150 metre wide Dwarka Expressway. Moreover, abutting Sectors 106, 110 and 112 of Gurgaon, giving it great proximity to top of the line physical & social infrastructure. The frontage of 180 metres shall make it a visible Landmark in the vicinity. 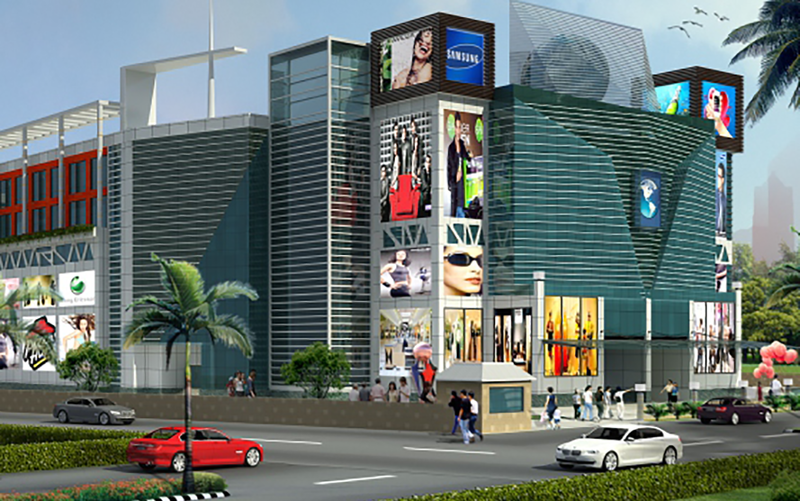 World Square Mall is a commercial space located precisely at the T junction of Mohan Nagar, Ghaziabad. It is now fully operational and functional and is now open for sale with 12 percent lease rent. 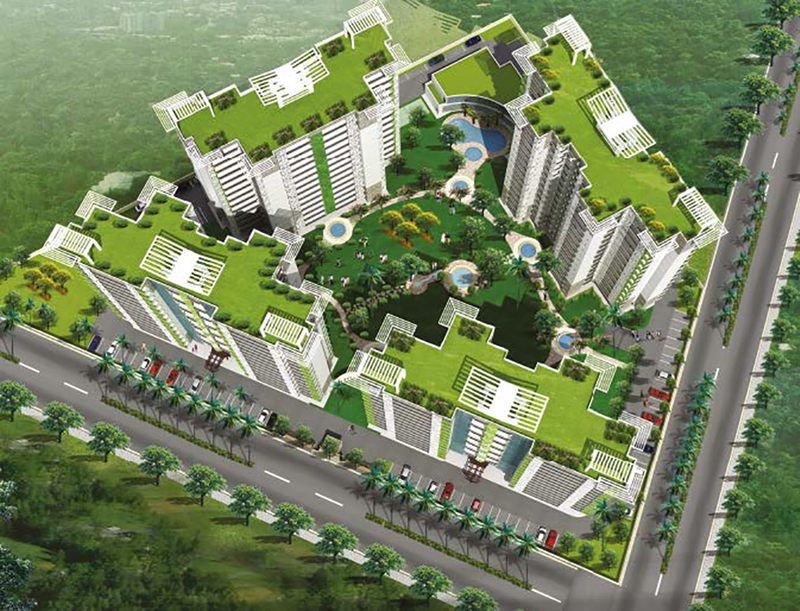 World Square extends more than 6 Lakh square feet of built up area. The mall primarily incorporates hypermarket, shops, entertainment, food court, hotel, gaming zone, banquet hall and many other sublime features that make a commercial space perfect. We have completed high grade government projects like Delhi Metro Rail Corporation (DMRC), Lucknow Metro Rail Corporation (LMRC), Rapid Metro and Jaipur Metro Rail Corporation (JMRC). DMRC-operated swanky and modern Metro system introduced comfortable, air conditioned and eco-friendly services for the first time in India and completely revolutionized the mass transportation scenario not only in the National Capital Region but the entire country. LMRC, being the fastest ever Metro project construction/execution in the country and the dream project of the people of Lucknow, has achieved the distinction of being the fastest Metro project execution that has ever been undertaken in the country. Successfully completed, Rapid Metro with a dedicated elevated corridor providing the highest levels of comfort for the passengers viz. fully air-conditioned world class coaches, provision for lifts and escalators at stations, modern automatic fare collection system, highest levels of passenger security systems, etc.